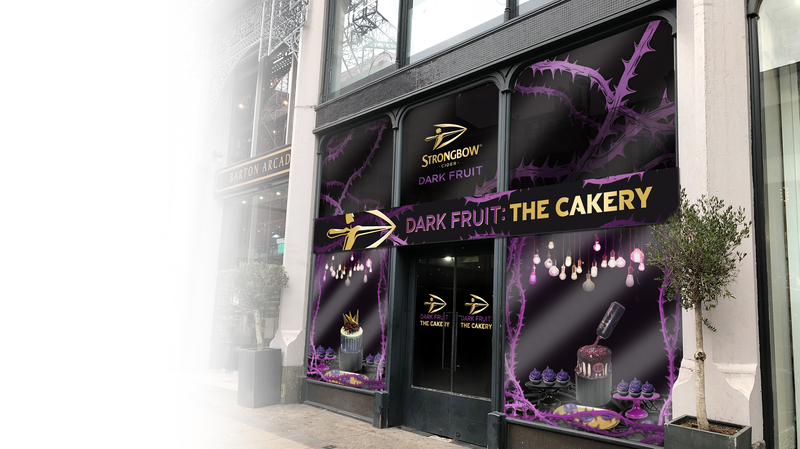 There’s a Strongbow Dark Fruit cakery opening in Manchester! The one-day pop up cakery will celebrate the latest craze of super fans, cider-themed cakes. The Cakery will open its doors on Saturday 24th November from 12-8pm, with proceeds of the baked goods being donated to a local Manchester charity. Strongbow Dark Fruit held a fan-led baking competition, hosted by British musician Example, in which two super fans teamed up with two cake artists to create a Strongbow Dark Fruit masterpiece. The teams had two hours to put their baking skills to the test, as their cakes were judged by the head baker of the popular Doughnut Time. They were scored on: ambition, creativity, taste and of course Dark Fruitiness. To spread the fruity joy, the winner’s creation will be the main attraction at the pop up, allowing Manchester’s super fans to check it out and try it too. The Cakery will offer an array of mouth-watering Dark Fruit baked goods, from delicious doughnuts made by Doughnut Time themselves to personalised cupcakes that make the perfect gift for a Dark Fruit loving friend! The pop-up will also see the return of Dark Fruit Ice Cream, which will be sandwiched between dark chocolate cookies. Earlier this year, Strongbow Dark Fruit fans in Manchester proved their love for the drink as it was voted one of the three cities Kyle Gentleman, and his famous Strongbow Dark Fruit ice cream should visit and give away just under 2,000 tubs to the people of Manchester!